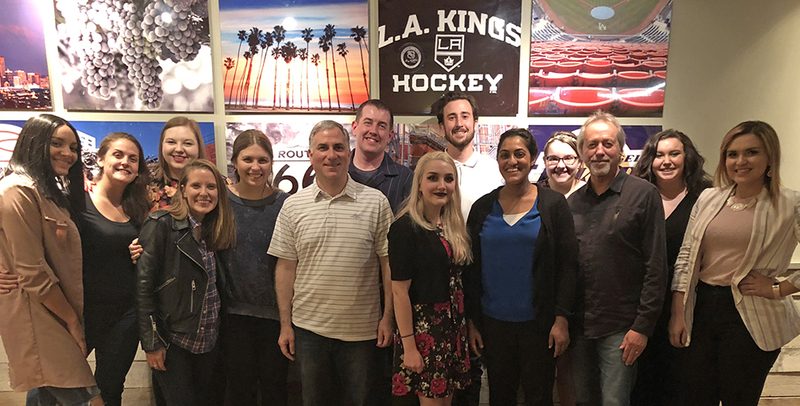 L to R: Jasmine Davison, Theresa Moio, Madison Lescallette, Rebecca Karch, Karley Ferlic, Steve Tanzilli, Jason Varnish, Alex Mecs, Chris Bowen, Anamika Misra, Alyssa King, Ed Traversari, Molly Knepper and Francesca Fronzaglio. 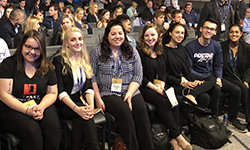 For the seventh year in a row, SAEM Associate Professor Ed Traversari, M.B.A., took sports, arts and entertainment management students to the annual Pollstar Live! Music Conference, held in downtown Los Angeles Feb. 6-8. "I can't think of another experience where our students get a more important impression of the live entertainment business. They get to interact and meet some of the most high-profile and powerful people in the entertainment business all while getting to work at the conference,” Traversari said. According to Traversari, this is the largest conference where managers, agents, record company executives and venue manager meet to discuss the latest trends and future of the entertainment industry. “I’ve wanted to attend Pollstar since my freshman year. I had the chance to network with both professionals and students, which will benefit me for years to come, said Alyssa King, a junior SAEM major from Strongsville High School in Strongsville, Ohio. "I met with an executive director of an organization I’m very passionate about. Without Pollstar, I probably never would have gotten the chance to speak with her," she added. 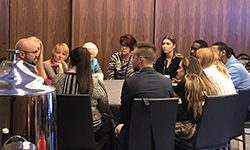 In addition to networking, the SAEM students worked at the conference and attended workshop sessions on topics such as stage management, event innovation and technology, back-of-house security and more. “Attending the roundtable breakfast sessions was my favorite part of the conference because we were able to network and learn from music industry professionals with all different perspectives,” explained Leah Sero, a junior SAEM major from Riverview High School in Verona, Pa.
Keynote speakers and panelists included Garth Brooks, Mark Cuban, Bon Jovi, Sharon Osbourne and top executives from Pandora, XM and Ticketmaster. The conference ended with the Pollstar Music Awards at the Wiltern Theatre. 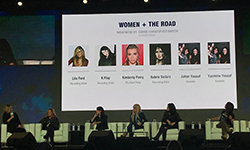 “I enjoyed hearing the keynote panel which had speakers like Bon Jovi and Scooter Braun. It was insightful to learn about how artists can contribute to charity and become more socially responsible. It’s an important topic that has been on my mind since the conference: How can we integrate social responsibility and activism into music?” said junior SAEM major Jessica Ignasky from Pittsburgh CAPA High School.